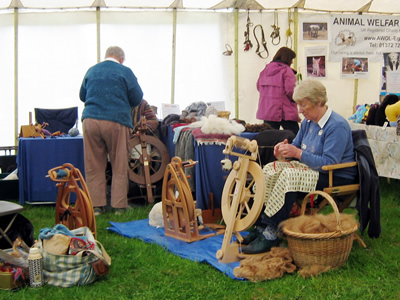 Today was spinning at Cowpie - in Betchworth this year. 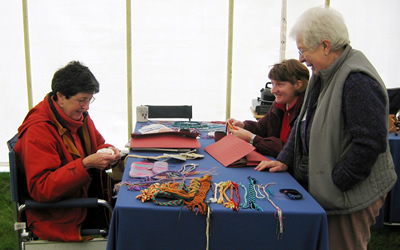 We had our own area and were demonstrating spinning and braiding etc. On the adjacent stand was a chap selling walking sticks. Somehow I managed to exclude him from my photos. However I bought one of the sticks for George. ( Not sure he wants or needs one but I have been keen to get him one for some time - they are wonderful works of art made from hazel, with carved antler and horn pommels from Jacobs, Portlands, Buffalo etc).